Using the Deep Security Manager interface, you can create a local, individual ruleset for each computer that you are protecting. Using the Deep Security API, you can also create shared rulesets and global rulesets. You can use one type of ruleset, or a combination. When you create a new shared ruleset using Deep Security 11.1 or newer, it can only contain hash-based rules (rules that compare only a file's hash and size). If you created a shared ruleset using Deep Security 11.0 or earlier, it contains file-based rules (rules that compare a file's name, path, size, and hash). Older shared rulesets will continue to use file-based rules until all agents using the shared ruleset are upgraded to Deep Security Agent 11.0 or newer. When all agents are version 11.0 or newer, the shared ruleset will be converted to use hash-based rules. Global ruleset: Like shared rulesets, global rulesets are distributed to agents by the manager (and also relays, if enabled). This increases network and disk space usage. However, because they are global, you don't need to spend time selecting them in each policy. Global rules aren't part of the rulesets you can see in Deep Security Manager. To view them, use the API. (See Use the Deep Security API to automate tasks.) Global rulesets can only contain block rules, not allow rules. You can use the API to create shared allow or block rules and apply the ruleset to other computers. This can be useful if you have many identical computers (such as a load balanced web server farm). Shared rulesets should be applied only to computers with the exact same inventory. If you see an error saying that the ruleset upload was not successful, verify that network devices between the agent and the manager or relay allow communications on the heartbeat port number or relay port numbers. 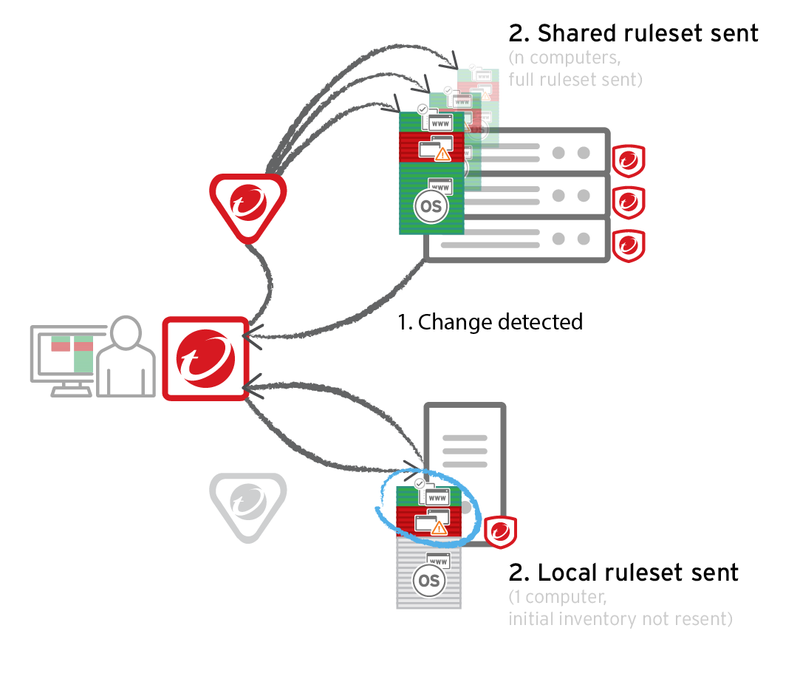 If the computer is currently using shared allow or block rules created via the API, you can change it to use local rules. Application control will scan the file system for all currently installed software and create an initial ruleset for it, similarly to when you first enabled application control.